A Merry Christmas and a Wonderful Holiday! Gina, are these cupcakes or gingerbread houses? This just popped up while I was making one of your delicious recipes. Feliz Navidad to you and your family Gina. Thank you for a year of wonderful recipes. The gingerbread houses are adorable. Merry Christmas Gina. I hope you and your family are having a great holiday season. Happy New Year!! Merry Christmas! Thank you for sharing all that you do. I look forward to your daily recipe and cook so much from your cookbook for my family. I can’t wait for your next cookbook. Merry Christmas Gina! Thank you so much for all that you do! I love your site, and I tell all my friends about it! These are adorable, it's like a mini Christmas village! Merry Christmas! I love the scene you set, the houses are festive! Merry Christmas to your family! Merry Christmas, Gina. You've made my life so much easier and healthier with your recipes. Hope you had a wonderful Christmas and that you have a happy, healthy new year! Merry Christmas to you & yours! 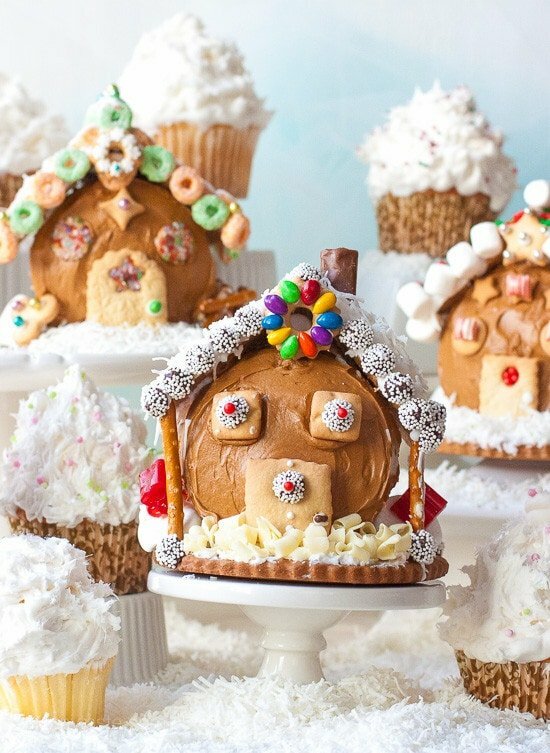 Love the cute holiday cupcake houses. Thanks for another great year of fabulous skinny recipes! How cute!! Merry Christmas to you too! Merry Christmas! Thanks for everything you do. Merry Christmas and happy new year! Love your picture! Oh my God, these look……Gorgeous! Merry Christmas to you also Gina. Thanks for all your awesome recipes. My family is loving everything I have tried. I've had fun putting together totally Weight Watcher holiday meals. Merry Christmas!! Thanks for all that you do for us all year long!!!!!!!!!!!! The Weight Watcher's Points Plus are soooooooooooo appreciated! Beautiful picture and greeting. Thank you for a year of wonderful healthy recipes. Merry Christmas & Happy New Year! Merry Christmas to you and your family! Love the Christmas message and the beautiful pictures of the cupcakes- creative and unique as always! You are so gifted Gina and we are blessed by the fruit of your creations. Thank you for being so generous in your sharing and for working so hard at creating recipes that are delicious and helpful in our pursuit of a healthy weight. You touch a lot of lives Gina. Thank you- have a blessed and beautiful New Year! Merry Chirstmas Gina….hope you and your family have a wonderful day. Merry Christmas! I'll be getting strictly back on Weight Watchers again as of January 2nd, however, I still haven't stopped making recipes from your site. Just because I'm not counting points, doesn't mean I still can't try and be somewhat healthy during the holidays! thank you for all you do and for putting in the time/effort. Have a great day! I'm looking forward to the new recipes in the new year! Merry Christmas to you Gina. Thank you for all the Yummy recipes. This is my Go 2 place! To you too! Thank you for all that you do! Merry Christmas Gina. Beautiful decorations. Merry Christmas to you and your family!! By the way your stuffed pepper soup was out of this world! When I told my Husband what I was making for dinner, he kind looked at me like ewwww. Then I put it in front of him and he said Mmmm, better then I thought and for Christmas Eve, he asked if we could have the leftovers for dinner, which we did! Thank you for all your wonderful recipes! Merry Christmas to you and yours – thanks for all the amazing recipes throughout the year! Be blessed! 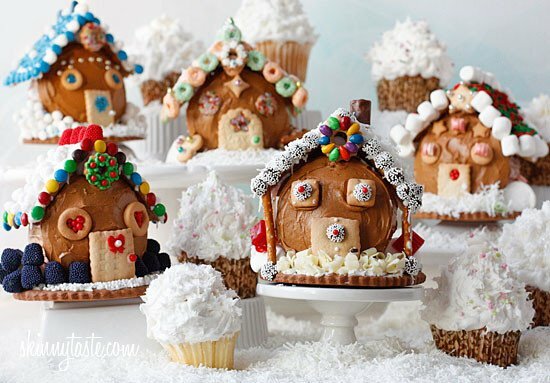 Adorable-love the gingerbread houses…Merry Christmas! Thank you for sharing your recipes and kitchen recipes through the year! Have a great holiday! Merry Christmas! Love you site! Wow! So creative! Merry Christmas! This looks beautiful, Gina! Merry Christmas! !